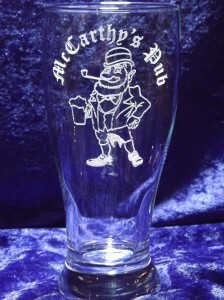 This 19oz Pub Pilsner Glass is the classic tavern style beer glass. It can be customized with your Business Logo, Social Club Emblem or any graphic you like. These glasses are laser engraved so the image will never wear off. Each glass can be engraved with your custom text, company logo or graphic.